Explanation: This stunning image from the orbiting Chandra X-ray Observatory is centered on the Vela pulsar -- the collapsed stellar core within the Vela supernova remnant some 800 light-years distant. The Vela pulsar is a neutron star. More massive than the Sun, it has the density of an atomic nucleus. About 12 miles in diameter it spins 10 times a second as it hurtles through the supernova debris cloud. The pulsar's electric and magnetic fields accelerate particles to nearly the speed of light, powering the compact x-ray emission nebula revealed in the Chandra picture. 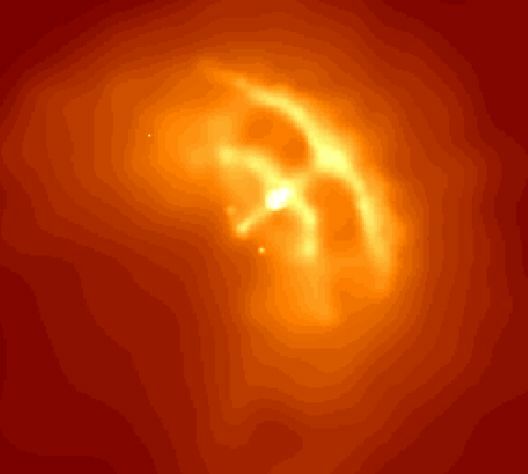 The cosmic crossbow shape is over 0.2 light-years across, composed of an arrow-like jet emanating from the polar region of the neutron star and bow-like inner and outer arcs believed to be the edges of tilted rings of x-ray emitting high energy particles. 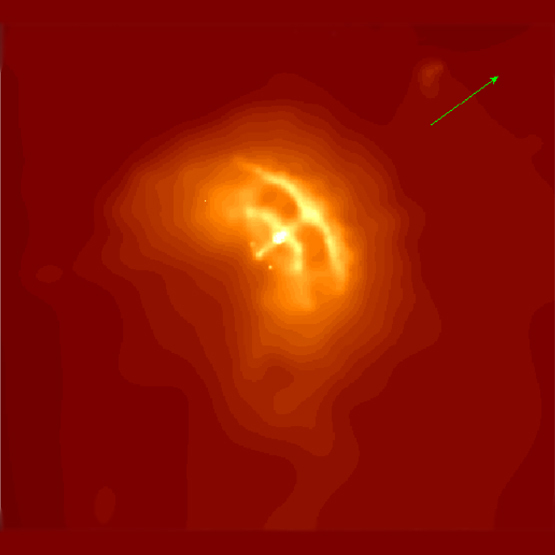 Impressively, the swept back compact nebula indicates the neutron star is moving up and to the right in this picture, exactly along the direction of the x-ray jet. The Vela pulsar (and associated supernova remnant) was created by a massive star which exploded over 10,000 years ago. Its awesome x-ray rings and jet are reminiscent of another well-known pulsar powered system, the Crab Nebula.